For grades 6-8, our resource meets the number & operations concepts addressed by the NCTM standards and encourages the students to review the concepts in unique ways. 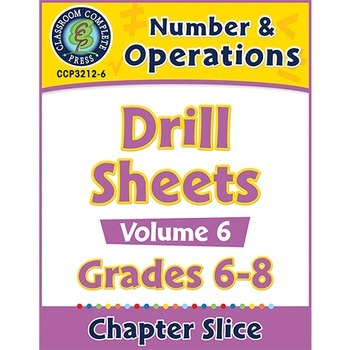 Each drill sheet contains warm-up and timed drill activities for the student to practice number & operations concepts. The pages of this resource contain a variety in terms of levels of difficulty and content so as to provide students with a variety of differentiated learning opportunities. 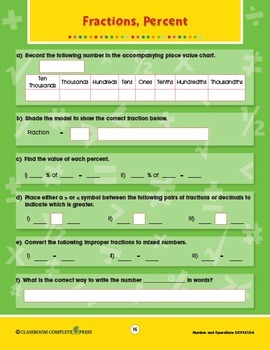 Included are questions involving place value, fractions, percent, decimals, multiplication and division. The drill sheets offer space for reflection, and opportunity for the appropriate use of technology. Also contained are assessment and standards rubrics, review sheets, color activity posters and bonus worksheets. All of our content meets the Common Core State Standards and are written to Bloom's Taxonomy, STEM, and NCTM standards.